The Supreme Court recently heard arguments on two challenges to the health care law’s mandate that requires many employers to include contraceptive coverage in their health insurance plans. But whatever the justices decide, the mandate has the support of a majority of the public, according to a Kaiser Health Tracking Poll released today. Over four-in-ten (44%) Americans said they followed news coverage of the cases “very” or “fairly closely,” which was a higher percentage than some other issues that have come before the court in Pew Research’s own polling. The controversy over the contraceptive mandate had first erupted over whether certain religious organizations should be exempted from it. But the two cases argued before the court in late March — Sebelius v. Hobby Lobby and Conestoga Wood Specialties Corp. v. Sebelius — involved challenges by for-profit businesses whose owners objected to the mandate on religious grounds. Kaiser found that the public supports the requirement that private health plans cover prescription birth control by nearly two-to-one. Women, younger adults, Democrats and independents are among the groups most likely to back the mandate. 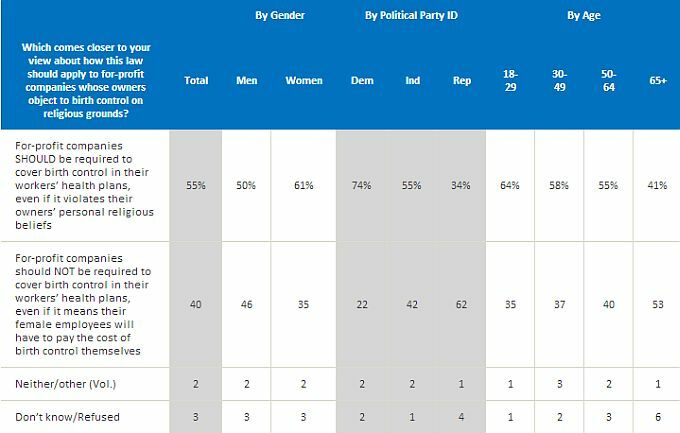 On the specific question of whether for-profit companies that have religious objections to providing the coverage should have to do so, the public, by a 55% to 40% margin, said they should be required to cover birth control even if it violates their owners’ religious beliefs.